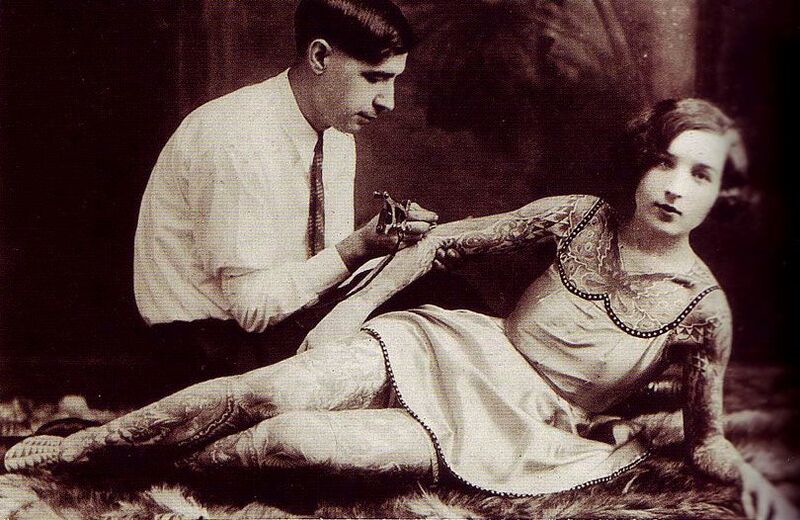 Tattoed babes, from the 1920s and 50s. Strange to think that this degree of body art was grotesque enough to warrant participation in a circus sideshow. Plus, tattooing a bra seems like a supremely bad idea. But our anonymous friend below is rocking a faux bra, and, dare I say it, it looks strangely...satisfying? 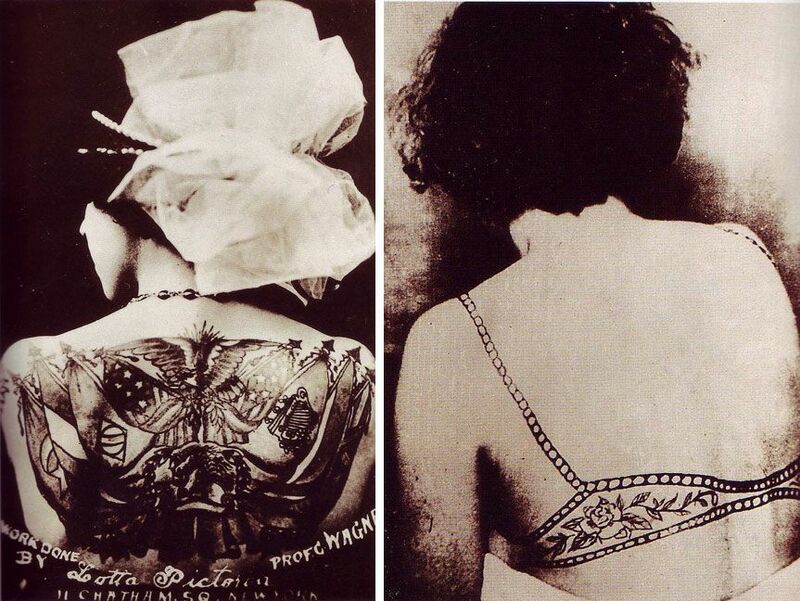 Left: Lotta Pictoria tattooed by Charles Wagner, NY, NY, 1920s. Right: Artist Unknown, 1950s. Below, Deafy and Stelly Grossman, 1920s. Scans from 1000 Tattoos, ed. Henk Schiffmacher. Wow wow wow!!! I want to see more photos from this book. I want to know more about Deafy and Stelly! I LOVE the tattooed bra. Very very awesome. Tattoos are not something commonly associated with this era (especially when it comes to women). Thanks for sharing! That is beyond awesome. I love ink, I love my ink, I love people with ink. I would love to see more of this book. But think about it, people who are that heavily tattooed kind of wind up in our own modern day freak shows of sorts. They always get showcased on those "OH MY GOD LOOK AT HOW FREAKING AMAZING/WEIRD/UNUSUAL THIS PERSON IS". Of course, they're a little more tattooed than that, but still. Love the bra tattoo and I'm not a tattoo chica! What a ballsy woman to get such a unique tattoo during that time period!